Michael Franti's documentary about the impact of war upon everyday citizens has caught the attention of the World Health Organization. 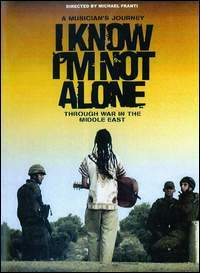 Franti, who made the film I Know I'm Not Alone to chronicle his trip to the Middle East in 2004. It takes a look at the impact upon lifestyles living in a war-ravaged nation has on people. Last week, Franti spent two days screening his film to WHO officials at United Nation headquarters in Geneva. The film’s impact spawned a panel, “The Human Face of Conflict and Health: Impact on Health Care Systems,” which included Franti and 50 WHO officials discussing the finer points of his film. I Know I’m Not Alone and Franti’s latest album, Yell Fire!, are set for a July 25 release from Anti-Records.